As I explained yesterday, there’s a decent chance that Romney’s embrace of Paul Ryan will hurt his chances among senior citizens. So the conventional wisdom follows that Romney is in deep trouble in Florida, the only retirement community to successfully apply for statehood. But while a protracted Medicare debate might very well hurt Romney among seniors national, his losses in Florida might not be as dramatic as the conventional wisdom suggests. If Romney gets hit among seniors, it’s going to hurt him everywhere—and it will hurt just a bit more in Florida. The case that Ryan will disproportionately hurt Romney’s chances in Florida depends on two assumptions: first, that the Ryan plan is more unpopular among seniors than other voters, and second, that Florida has so many more seniors that Romney’s losses would be especially acute in Florida. At this stage, there’s actually cause to question the first assumption—even if the Ryan plan is unpopular, it’s not entirely clear that the Ryan plan is much less popular among seniors than it is with other age groups. For instance, seniors were conspicuously absent from the Democracy Corps memo showing Obama making big gains after voters heard competing messages about the Ryan plan. Instead, Obama made his biggest gains among base demographics—the so-called “rising American electorate”—and independent voters, who presumably erred toward the status quo when confronted by an ambitious reform package. And a Gallup poll found that seniors actually preferred the Ryan plan to the Obama deficit plan. That matters for whether Romney suffers especially large losses in Florida, because if every age cohort liked or disliked the Ryan plan equally, then the change in Romney's support wouldn't vary across states. But let’s grant that first assumption for the moment, so we can test whether the Ryan plan would have an especially disproportionate impact in Florida if the Ryan plan were indeed especially unpopular among seniors, as it very easily might be. The answer might be surprising, at least if you’ve spent the majority of your time in the Sunshine State visiting parents or grandparents in Ft. Lauderdale or Palm Beach. 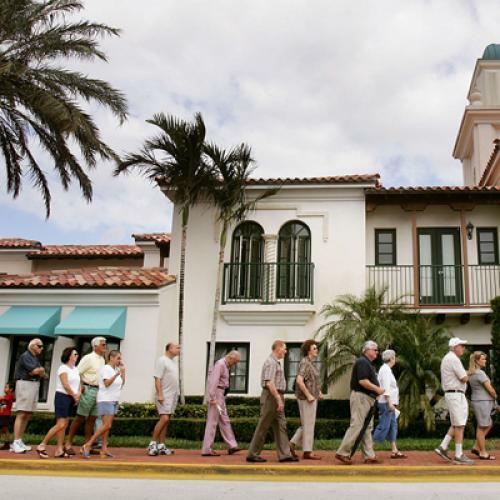 It turns out that Florida isn’t a giant retirement community worth 29 electoral votes: 78 percent of Florida voters were younger than age 65 in 2008. That’s surely older than the country and the other battlegrounds—but perhaps not by as much as you might think. Seniors were 16 percent of the electorate nationally in 2008, so seniors were a 37 percent larger share of Florida the electorate than they were nationally. That is a meaningful difference, but it’s not such a large difference that we would expect Florida to move from, say, a toss-up to lean-Obama while all the other states remained locked in their prior positions. For illustrative purposes, let’s test an extreme hypothetical that maximizes the influence of the Ryan plan on seniors: Imagine that Romney loses every undecided voter over age 65, but the Ryan plan doesn’t sway any voter under age 65. According to Gallup, about 8 percent of seniors are undecided, and if Obama won all of them, he would lose seniors by a narrow 49-51 margin—even better than Obama’s 2008 performance. How much would Obama gain in this unlikely scenario? He would improve by a net-2.5 points in the national popular vote and 3.5 points in Florida. So even in an outlandish case where every effect of the Ryan plan are concentrated among seniors, Florida only moves a net-1 point toward the left with respect to the nation as a whole. Now this isn't quite as simple as the demographics: Geography makes it possible for Medicare to have outsized influence in Florida. Since Florida seniors are concentrated in several media markets—like Palm Beach and Ft. Myers-Naples—the campaigns can choose to emphasize Medicare and other issues in those media markets. In contrast, seniors outside of Raleigh might not get the same deluge of Medicare advertisements if the Obama campaign decides to air advertisements about Planned Parenthood and contraceptives in a market with a large number of college-educated women. As a result, it's possible that campaign strategies could cause Medicare to have an outsized effect in Florida. The upshot: There’s no guarantee that the Ryan plan devastates Romney’s chances among seniors. But if Romney does struggle among seniors, that’s going to hurt Romney everywhere, not just in Florida. Yes, those losses would be larger in Florida, but perhaps not as much larger as the conventional wisdom suggests, and certainly not so much larger that media coverage about the fight over seniors should focus exclusively on the danger Romney faces in Florida. There are plenty of seniors in every battleground state, and losses among the elderly would be costly to Romney's chances across the map. Paul Ryan doesn't change the electoral map.